Long ago, it was reported that Angelina Jolie would star as Cleopatra in a remake of the classic Elizabeth Taylor period drama. Now it looks like she may actually have some competition for the role. Lady Gaga is rumored to want the lead, but it's unclear if the movie is still moving forward at this time. Cleopatra has been in the planning stages for nearly a decade, with Angelina Jolie long locked into play the lead. It has been a passion project for the Oscar winning actress. But new rumors are starting to swell that Lady Gaga may want to make Cleopatra her follow up to the award-worthy A Star is Born, which is expected to get a Best Picture nomination at this year's Oscars, and could even see Lady Gaga going home with a Best Actress award. OK! Magazine was first to make the revelation back in early January, claiming that Lady Gaga had plans to crash Angelina Jolie's dreams of bringing the legendary Queen of Ancient Egypt back to life on the big screen. The pop singer is said to be heavily 'veying' for the role. An insider had this to say about the prospects of Lady Gaga actually winning the lead in the long-anticipated movie. 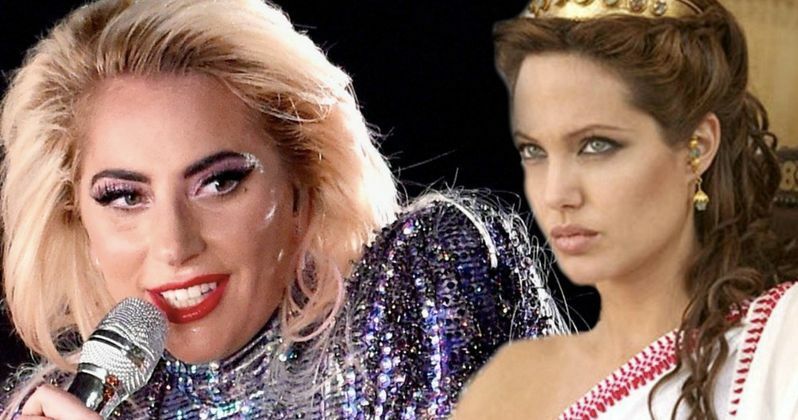 "Angie has wanted to work on the film for a very long time, but it looks like she's going to have to go up against Lady Gaga for the lead. Gaga feels like she's at the perfect point in her career to tackle a role like this." This all just sounded like a hot rumor at first blush, but now a 'senior production source at Sony' has apparently chimed in on the impending movie and who will lead it to possible Oscars glory. The Daily Sun dropped a report that said this. "Cleopatra was known as the Queen of the Nile, and Elizabeth Taylor firmly established herself as Hollywood's queen in the 1963 film version. There's every reason to think that whoever gets to play her this time round is going to enjoy an equally lofty perch in the motion picture industry." This latest news claims that the race between the two actors is so close that they will both have to audition for the part, which is virtually unheard of when it comes to two A listers. Cleopatra has never been announced as a musical. So it's unclear at this time if that aspect will change if and when Lady Gaga actually does win the role away from Jolie. "I'm about to read the script. It just feels right to me after all the other types of films I've done. What does it have in common with any of them? They're all totally different! That's what makes this perfect." Nothing ever came of Ang Lee meeting with Sony for the coveted job. James Cameron has since moved onto making four Avatar sequels. Back in September of 2017, Blade Runner 2049 director Denis Villeneuve was in early talks. He's doing the Dune remake instead. The new movie is based on Stacy Schiff's 2010 book Cleopatra: A Life. There is no official word from Sony when Cleopatra will start to heat back up. But it looks like there will be some completion for that lead role. If Lady Gaga wins her first Best Actress Oscar this year, that may just give her the leg up she needs to land the part. This news originated at OK Magazine.